The Qt console is a very lightweight application that largely feels like a terminal, but provides a number of enhancements only possible in a GUI, such as inline figures, proper multi-line editing with syntax highlighting, graphical calltips, and much more. The Qt console can use any Jupyter kernel. 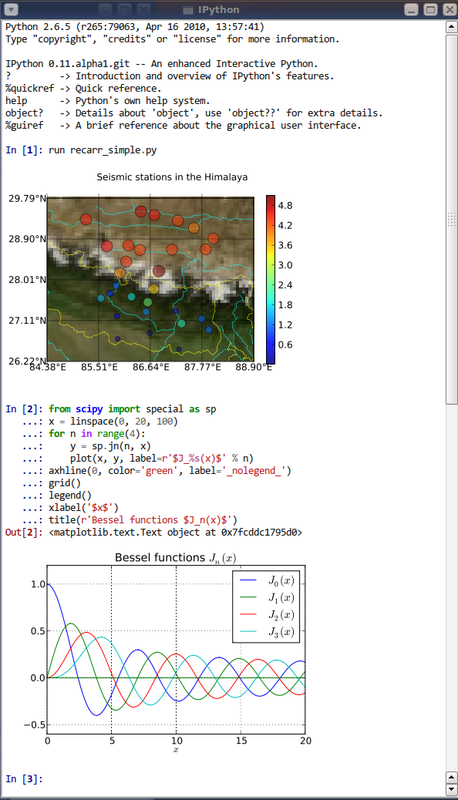 The Qt console with IPython, using inline matplotlib plots. The Qt console frontend has hand-coded emacs-style bindings for text navigation. This is not yet configurable. Since the Qt console tries hard to behave like a terminal, by default it immediately executes single lines of input that are complete. If you want to force multi-line input, hit Ctrl-Enter at the end of the first line instead of Enter, and it will open a new line for input. At any point in a multi-line block, you can force its execution (without having to go to the bottom) with Shift-Enter. One of the most exciting features of the Qt Console is embedded figures. 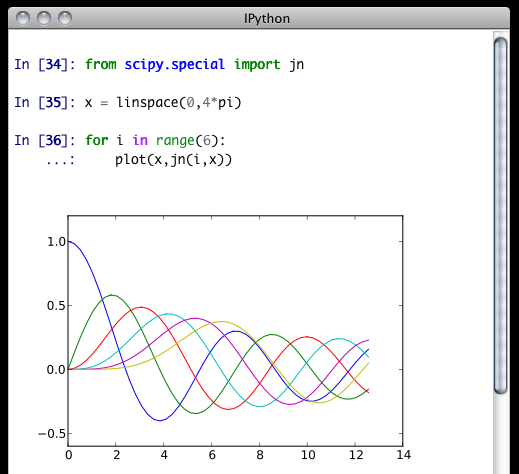 You can plot with matplotlib in IPython, or the plotting library of choice in your kernel. The Qt Console has the ability to save your current session, as either HTML or XHTML. Your inline figures will be PNG in HTML, or inlined as SVG in XHTML. PNG images have the option to be either in an external folder, as in many browsers’ “Webpage, Complete” option, or inlined as well, for a larger, but more portable file. Or, you can add the same line (c.Inline… instead of %config Inline…) to your config files. The Qt widget, however, has full syntax highlighting as you type, handled by the pygments library. The style argument exposes access to any style by name that can be found by pygments, and there are several already installed. Calling jupyter qtconsole -h will show all the style names that pygments can find on your system. Since the Kernel listens on the network, multiple frontends can connect to it. These do not have to all be qt frontends - any Jupyter frontend can connect and run code. Other frontends can connect to your kernel, and share in the execution. This is great for collaboration. The --existing flag means connect to a kernel that already exists. Starting other consoles with that flag will not try to start their own kernel, but rather connect to yours. kernel-12345.json is a small JSON file with the ip, port, and authentication information necessary to connect to your kernel. By default, this file will be in your Jupyter runtime directory. If it is somewhere else, you will need to use the full path of the connection file, rather than just its filename. If you need to find the connection info to send, and don’t know where your connection file lives, there are a couple of ways to get it. If you are already running a console connected to an IPython kernel, you can use the %connect_info magic to display the information necessary to connect another frontend to the kernel. if this is the most recent kernel you have started. Since the ZMQ code currently has no encryption, listening on an external-facing IP is dangerous. You are giving any computer that can see you on the network the ability to connect to your kernel, and view your traffic. Read the rest of this section before listening on external ports or running a kernel on a shared machine. Messages are not encrypted, so users with access to the ports your kernel is using will be able to see any output of the kernel. They will NOT be able to issue shell commands as you due to message signatures. The one security feature Jupyter does provide is protection from unauthorized execution. Jupyter’s messaging system will sign messages with HMAC digests using a shared-key. The key is never sent over the network, it is only used to generate a unique hash for each message, based on its content. When the kernel receives a message, it will check that the digest matches, and discard the message. You can use any file that only you have access to to generate this key, but the default is just to generate a new UUID. In simple cases, Jupyter’s tools can forward ports over ssh by simply adding the --ssh=remote argument to the usual --existing... set of flags for connecting to a running kernel, after copying the JSON connection file (or its contents) to the second computer. There are two primary models for using SSH tunnels with Jupyter. The first is to have the Kernel listen only on localhost, and connect to it from another machine on the same LAN. This section is relevant regardless of the frontend you use to write Qt Code. This section is mostly there as it is easy to get confused and assume that writing Qt code in the QtConsole should change from usual Qt code. It should not. 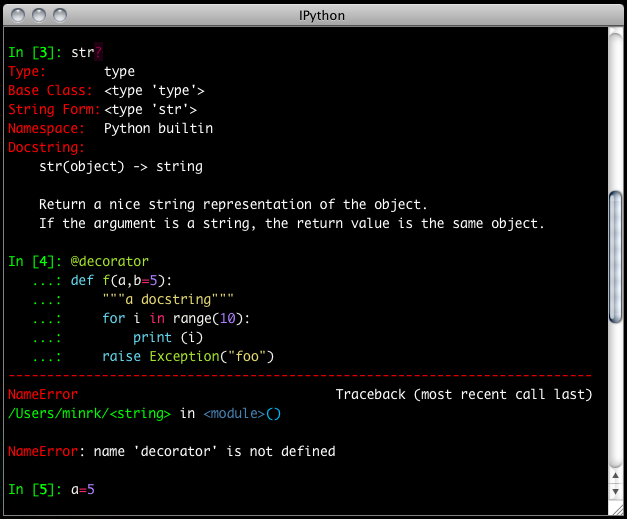 If you get confused, take a step back, and try writing your code using the pure terminal based jupyter console that does not involve Qt. An important part of working with the REPL – QtConsole, Jupyter notebook, IPython terminal – when you are writing your own Qt code is to remember that user code (in the kernel) is not in the same process as the frontend. This means that there is not necessarily any Qt code running in the kernel, and under most normal circumstances there isn’t. This is true even if you are running the QtConsole. When executing code from the qtconsole prompt, it is not possible to access the QtApplication instance of the QtConsole itself. # we are in the kernel in most of the case there is NO qt code running. # we need to create a Gui APP. Use qtconsole.rich_jupyter_widget.RichJupyterWidget in your Qt application. This will embed the console widget in your GUI and start the kernel in a separate process, so code typed into the console cannot access objects in your application. See examples/embed_qtconsole.py for an example. Start an IPython kernel inside a PyQt application ( ipkernel_qtapp.py in the ipykernel repository shows how to do this). Then launch the Qt console in a separate process to connect to it. This means that the console will be in a separate window from your application’s UI, but the code entered by the user runs in your application. Start a special IPython kernel, the ipykernel.inprocess.ipkernel.InProcessKernel, which allows a QtConsole in the same process. See examples/inprocess_qtconsole.py for an example. This allows both the kernel and the console interface to be part of your application, but it is not well supported. We encourage you to use one of the above options instead if you can. © Copyright The Jupyter Development Team Revision 06cd5441.